* WhatFont is not affiliated with MyFonts and/or the WhatTheFont service. What is the easiest way to find out the fonts used in a webpage? Firebug or Webkit Inspector? No, that's too complicated. It should be just a click away. Hence I wrote WhatFont, with which you can easily get font information about the text you are hovering on. To embrace the new web font era, WhatFont also detects services used for serving the font. Now supports Typekit and Google Font API. On any webpage, click your WhatFont bookmark to use the tool. Full support: Firefox 3.6+, Chrome 9+, Safari 4+, Internet Explorer 9. Limited support: Internet Explorer 8. ↑Install the extension from Chrome Web Store. On any webpage, click WhatFont button to use the tool. Since Safari 12, extension are installed through Mac App Store. >After downloading, launche the WhatFont app, and enable WhatFont extension in Safari. The tool should auto-update itself. If you do not get the newest feature, please reinstall. Minor updates for each extensions will not be logged. Added color detection for text. Added a tweet button for instant sharing through Twitter. 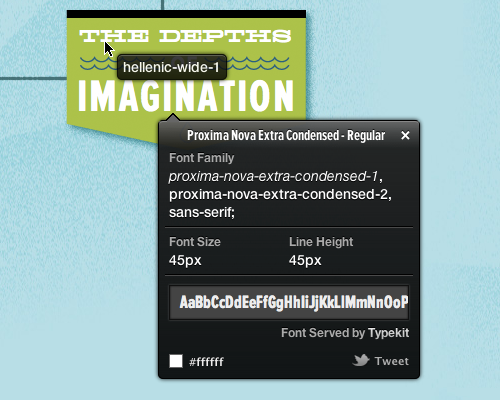 Added font services detection for Typekit and Google Font API. (Chrome Extension) Fixed the toolbar button bug, the second click now exits WhatFont. Fixed several bugs related to style reseting. Added a prompt for <img> and <embed>. Added an external service for <img>. Fixed several bugs related to DOM to support Internet Explorer 8+. Added a shortcut (ESC) for exiting. Merged Riobard's fork to reveal the font currently in use. Many thanks to Riobard for the font-in-use detecting code. Thanks to Bennett McElwee for the default font bug fix. Thanks to @pr0n, @hugoahlberg, @zhusee2 and Brian Majerus for helping me test. The external links included in WhatFont are being provided as a convenience; they do not constitute an endorsement or an approval by me. No personal information will be collected by this script.